The October issue of Tabletalk looks at the sixteenth century. 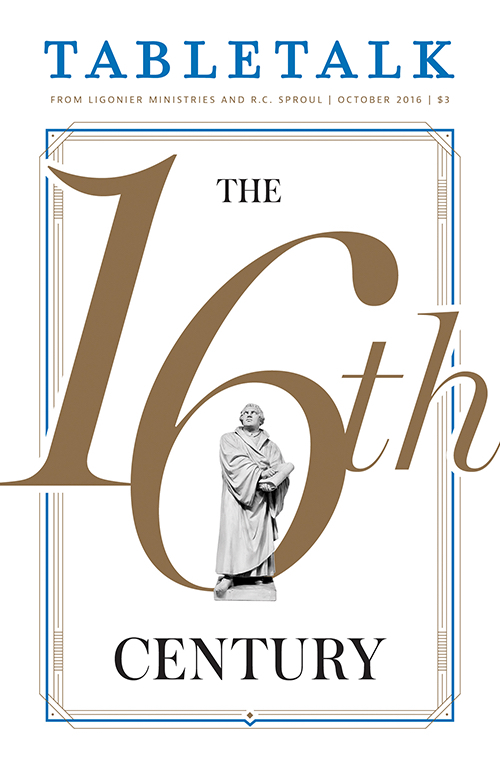 In particular, the goal of this issue is to introduce readers to the key events, people, publications, and ideas that shaped the Protestant Reformation. After explaining the necessity of the Reformation and the history of the sixteenth century, it will consider how the Reformation addressed a variety of topics such as theology (Scripture and justification), the church (worship and sacraments), the home (family and piety), and society (vocation and education). The issue will consider the vast scope of the Reformation in order to give a greater appreciation not only of its history but also of the need to continue the work of the Reformation today. Subscribe to Tabletalk today for only $23 a year, and $20 to renew. You save even more if you get a 2- or 3-year subscription (as little as $1.36 per issue). Get your subscription to Tabletalk today by calling one of Ligonier Ministries’ resource consultants at 800-435-4343 or by subscribing online and receive immediate access to the digital edition. Each month, Tabletalk carefully selects resources to help you grow as a Christian. Browse this month’s resources here. The November issue will consider the biblical-theological theme of maturity. Maturity is a combination of wisdom, kindness, and endurance—a “growing up” in love. The December issue will consider the biblical-theological theme of remembering God. Throughout the Bible, we are told about the dangers of forgetting God and the importance of remembering Him. The January issue will assist believers in understanding true success, pursuing success, and responding appropriately when we do not feel successful. Subscribe to Tabletalk today for only $23 a year, and $20 to renew.